Completely pooped ─what a day, what a day. Wow. I look around at the aftermath of getting ready this morning and it’s a complete hazard zone. A cupcake calamity. From butter, sugar and frosting on every countertop and cupcake pans, boxes and other paraphernalia strewn everywhere, to open closet doors as I hunted for bags and threw my clothes on this morning. But it was all worth it (how many times have I used this phrase in my blog now?). Picture captured in a remote corner of our apartment where I could crop out the mess! 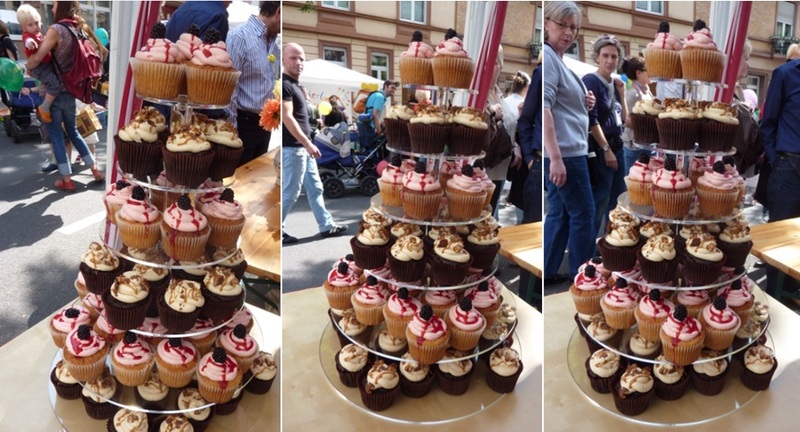 This weekend was Rotlintstrasse Fest and I made, frosted, decorated, packed, transported, set-up a tower of 72 cupcakes. Mr. Cupcake is out of town so it was up to me to make things happen as a solo act. It was tough. My mind had to be constantly alert. I had to stay on task and on time and to organize everything myself. I couldn’t just use my popular catch-phrase: “Babe, can you help me with this one little thing.’ Everything was on me. I had to not only make sure everything was done to the last detail, but to do it myself. Even the little things like packing the elevator and making sure not to lock myself out! So onto the cupcakes themselves. As mentioned in my previous post, I decided to go for a more ‘o’naturale’ look with fresh berries and a household brand like Snickers. It was a neighbourhood festival so I decided to make my cupcakes more familiar and not as flamboyant. I went with French vanilla cupcakes with tinted pink buttercream frosting, drizzled with homemade raspberry coulis and topped with a blackberry. For the chocolate lovers, I made my Belgian chocolate cupcakes, topped them with caramel infused buttercream and drizzled them with caramel (German caramel tastes a bit more like butterscotch though!) and then finished them off with chopped frozen Snickers bars. After setting up my tower, I took a few shots. 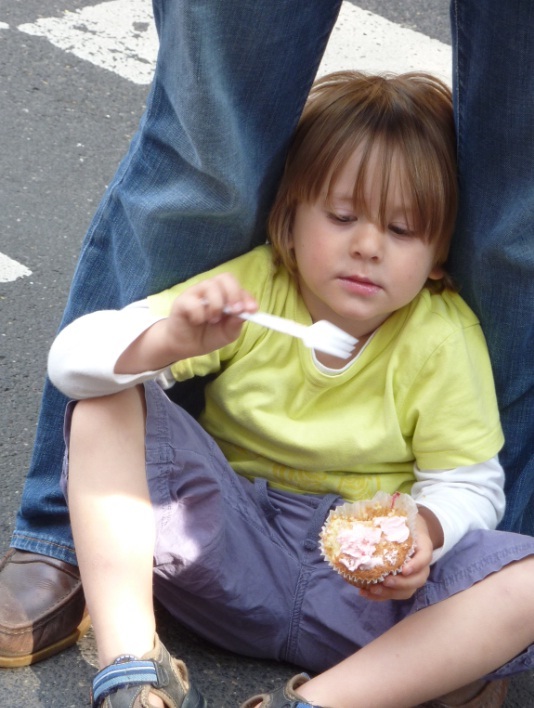 Inadvertently on each photo I captured a different cupcake customer group. Cupcakes don’t discriminate. I got my space at the festival from A-viva (so gracious!) 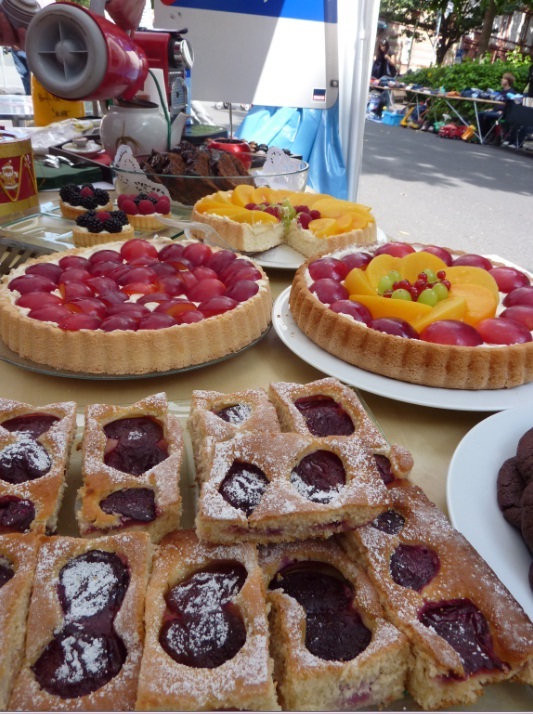 which was selling beautiful fruit tarts and cakes as well as other cuisine delights made by the international language students. A-viva and I will be donating all our proceeds to the flood victims in Pakistan (yet another reason why A-viva is the best Sprachschule (language school) in Frankfurt!). I sold alongside a Spanish A-viva volunteer who was a fantastic sales guy. We sold-out of cupcakes in about 4 and half hours and I was happy to call the day a success. As I finish this post, I am absolutely pooped-to-the-max, my home is messier than a pigsty but I love life. 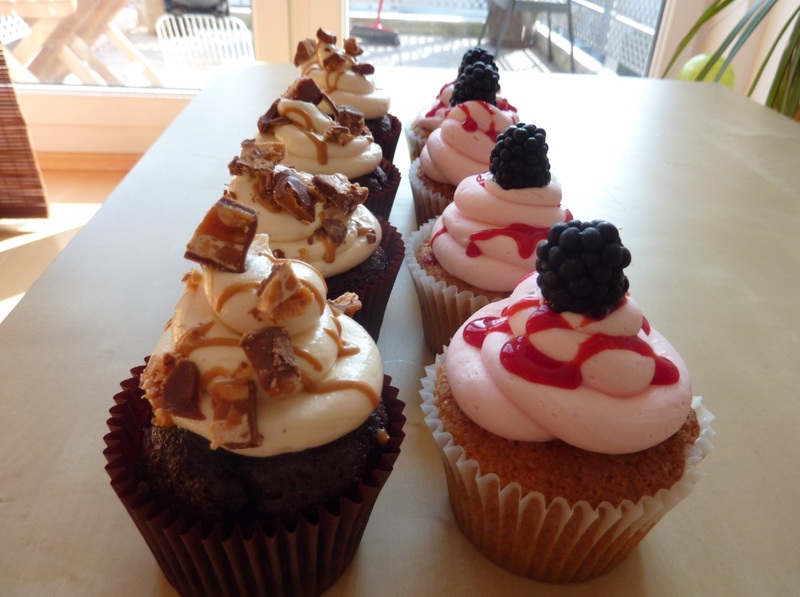 Cupcakes are fantastic and I love, Love, LOVE selling them especially when all the profits get donated to a good cause! After I get this house in order, I am treating myself to a long bath and a manicure. P.S. No, seriously. If a pig walked into my house right now, he would laugh in my face and give me the number for a Frankfurt maid service. Immediately. First…your work looks amazing (both beautiful and tasty)! Second, I am looking for language schools in Frankfurt and your post came up on my search…so I was wondering if you would recommend A-Viva for someone like myself: no knowledge of German, never been to Frankfurt and has little connection there in general?…some place where I wouldn’t feel too anonymous while not spending a fortune to learn. Side note: I am coming to learn German in the hopes that I am accepted to a Masters program in Berlin (taught in English for obvious reasons). Thank you for any and all help…it is hugely appreciated!! !